Celebrating Windows Phone 7's "Release to Manufacturing" status, Microsoft employees held a morbid funeral parade for the iPhone and Blackberry. 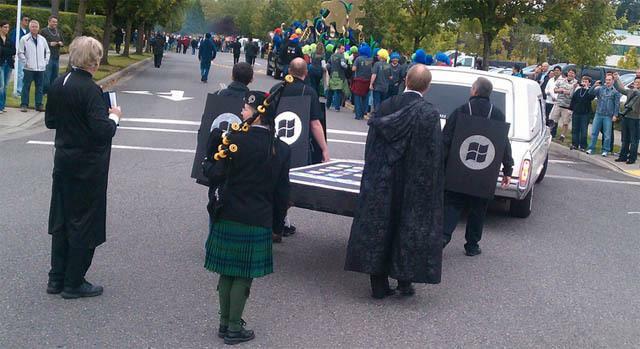 The parade through the company's Redmond campus, first reported by NeoWin, included hearses, oversized iPhone and Blackberry coffins, and various Halloween-like costumes. One truck featured a sign bragging, "Windows Phone 7 OS Platform buries the competition." In doing so, Microsoft takes its place in a long line of products that were billed as "iPhone killers." Various sources have reported that Windows Phone 7, which went RTM last week, will launch at an October 11 event in New York City, although the first devices wouldn't be available until late October in Europe and November in the U.S.
Microsoft posted a teaser trailer for Windows Phone 7 on YouTube last week, the first in what is expected to be a $500 million marketing campaign for the launch of the mobile OS. Research firm Gartner predicted Friday that the Windows Phone market share would fall from 8.7 percent in 2009 to just 3.9 percent in 2014. Nokia Symbian and Google Android were placed at first and second with 30.2 percent and 29.6 percent respectively. Apple's iOS was listed in third place with an estimated 14.9 percent market share in 2014.